The following report of naked bathers in the Canal comes from the Limerick Chronicle 27 May 1818. Several complaints having been made to the Mayor, of the impropriety and indecency of bathing in the canal, he has directed constables to arrest any person who may attempt such in future, and is determined to punish with the utmost rigour, such as may be brought before him for offending in that way. The canal, in fact, is the only pleasant walk which the citizens can resort to, and while so abominable a custom of naked men appearing on its banks is permitted, delicate females are at once debarred from approaching it. 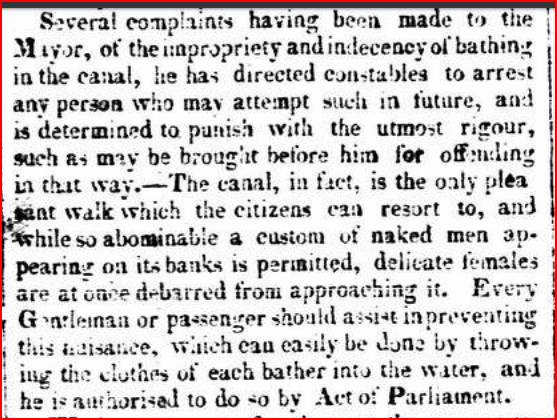 Every Gentleman or passenger should assist in preventing this nuisance, which can easily be done bt throwing the clothes of each bather into the water, and he is authorised to do so by Act of Parliament.